one of my realizations while i was out drenched in buckets of sweat and lost in a sea of many-colored heads in the streets of kalibo, was that the xylophone is no girl's toy. next perhaps to the extended family of drums, it is the most masculine among all the percussion and wind instruments, its tinny, tiny ting rising above the bangs and snares of its bigger neighbors. it is also perhaps the most versatile. i've never heard such dynamic range, from standard parade tunes to an overplayed version of the chorus of "la cucaracha", a medley that involves repeating daniel boone's "beautiful sunday", and even a syncopated rendition of travie mccoy's "billionaire". the other realization was this: that i could be at my craziest, wildest, and most conspicuous on the feast of the ati-atihan, and blend perfectly in. my attendance in the mother of all religious fiestas around the christ child was delayed by a year. in 2009, i purchased a ticket six months ahead of the 3rd weekend of january. a few months later, a close friend told me not to be absent at his wedding which fell precisely on those dates, and i had to postpone my plans. a few months into last year, i once again purchased return tickets to kalibo during a fire sale by air philippines. late into 2010, however, they informed me that they had canceled their kalibo flights and that i could apply for a refund instead. i was of course devastated. but charm worked its way and i was booked flights with PAL at no additional cost. and on the day that i checked in, they put me on the exit row with the big leg room, normally a premium paid seat, but one which i got for free. after an hour's flight, i checked in what is probably one of the worst accommodations available in kalibo: my room could not be locked, the ceiling had a leak, the mattress was thin and lumpy, but whose location was golden. i was quite literally a stone's throw from all the action. and what action there was. 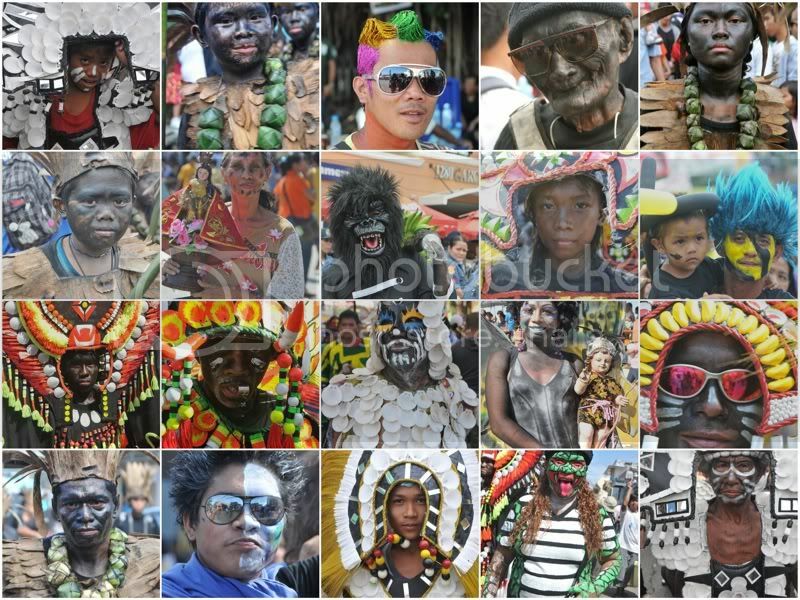 i have been a serious fiesta man since 2008 when i first encountered the dinagyang festival in iloilo. however, my love affair with festivals began at the aliwan in 2003, when i still shot in film using a nikon F80, and the streets were filled with revelers instead of photographers. to this day, i have seen a few: sinulog in cebu, masskara in bacolod, pintados in tacloban, panagbenga in baguio, and even accidentally stumbled over daet's pinyahan festival once upon a time. i've also attended the loy krathong in bangkok and songkran in chiang mai, and early into the last decade, while i was still studying law, i watched the the feast of the black nazarene in quiapo. i was pretty sure i wasn't the only one seeking out fiestas across the archipelago to attend, and i pleasantly bumped into social entrepreneur illac diaz scouring the area around pastrana park, looking for things to photograph. 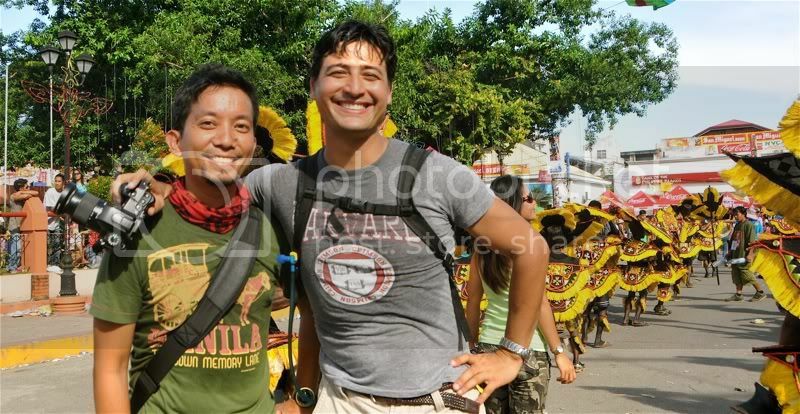 i had also previously seen him at the masskara. the ati-atihan festival remembers the legendary revelry that followed a deal between bornean migrants and the native atis. what started out as a pagan ritual was added a christian flavor upon the arrival of the spanish friars. today, it is uncertain whether it is more christian, more pagan, or more an excuse to be wacky. 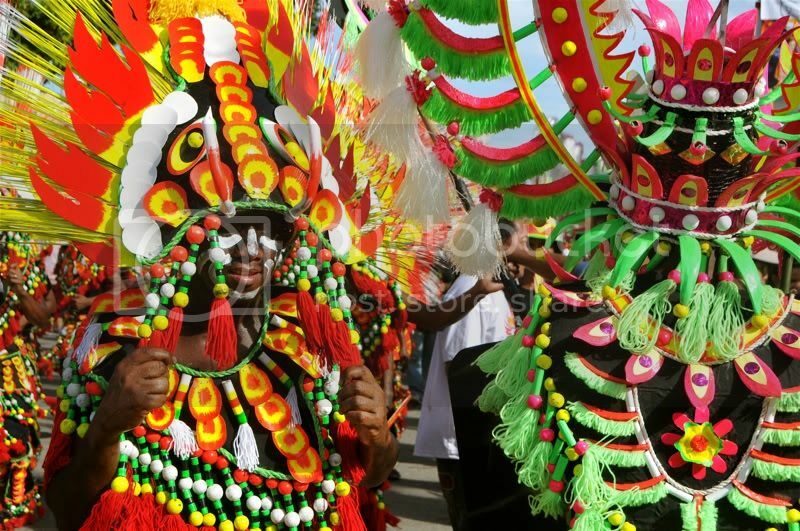 compared to other fiestas, the ati-atihan, while being the oldest, is relatively small. it is a bit more personal. in fact, one might think that the groups in kalibo, stacked against the tribes in iloilo, are a little limp, even lethargic. while dinagyang warriors court exhaustion with their electrifying choreography, ati-atihan street performers just stomp their feet and shake their bodies. 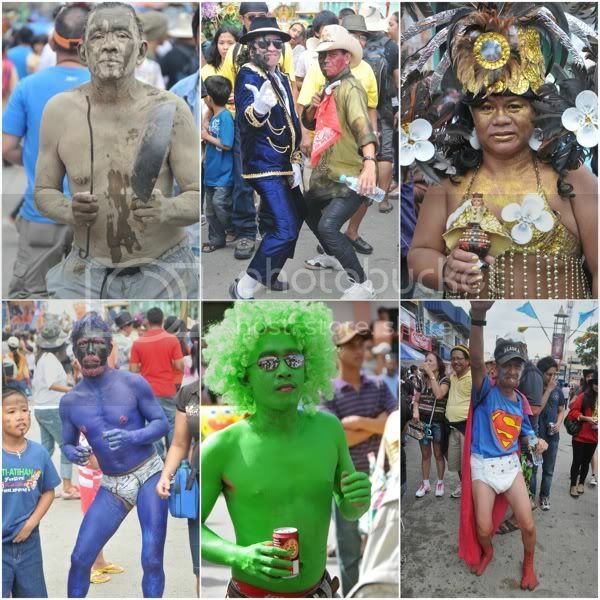 there also isn't much in the way of costumes, unlike what you might see at sinulog or masskara. the black soot wears off quickly, and the headdresses and armors are a little drab. 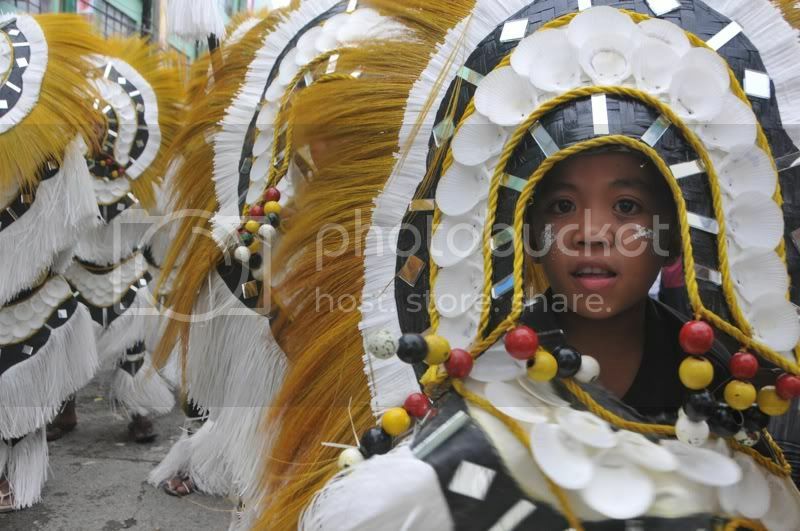 but among all the fiestas that i've been to, the ati-atihan will be the one that i will keep returning to. in stark contrast to all the rest, the street party in kalibo will cast a spell on anyone who might be fortunate to stand at a street corner on the third weekend of january. there is something hypnotic about the day-long festivities, starting perhaps shortly before lunch time, when late risers from last night's debauchery lay out bottles and skewered delights on the street. percussionists and trumpeters bang and blow, often not in unison, and the frenzy draws you in with its small town appeal: few people here care about the prize money or the recognition. some aren't even in competition. they might not even care about promoting a product, a service, or a politician. what they most care about is having a great time in the streets. and this longing is infectious. not that i needed the virus to do things many of my friends might be embarrassed to do elsewhere. i've always been a carrier, and kalibo helped me exhibit the symptoms. i plunged right into the heart of the merriment. after having taken as many pictures as i possibly could, i decided to leave my camera behind and let the party affect me, that i became the party. i took position on the center island right across my lodging house and danced with nary a care in the world. throngs of people streamed past me with their costumes, their painted faces, their images of the christ child, their bands, and their booze. many times, i accepted suspect liquids from complete strangers, and with one sip, i must have kissed the lips of many other paraders. i was so many times lost in the moment. and it was easy to be lost in the beguiling parade that didn't seem to end. i have often been asked why i often decide to duke it out alone. when i planned this trip, i didn't invite anyone, although i did mention it several times. the reason i don't is that i deride being turned down, and also because i sometimes think that the best laid plans have a way of going awry. but more importantly, i've always found comfort in solitude. i may be alone, but i am not lonely. i may be by myself, but i am never by my lonesome. i like the freedom of spontaneity, not hearing complaints but my own, not worrying about others but myself. upon my arrival in kalibo on friday evening, i immediately sought things to do. it didn't take long for me to find a reggae bar right in front of the fire station, where, rather ironically, they featured fire dancers. 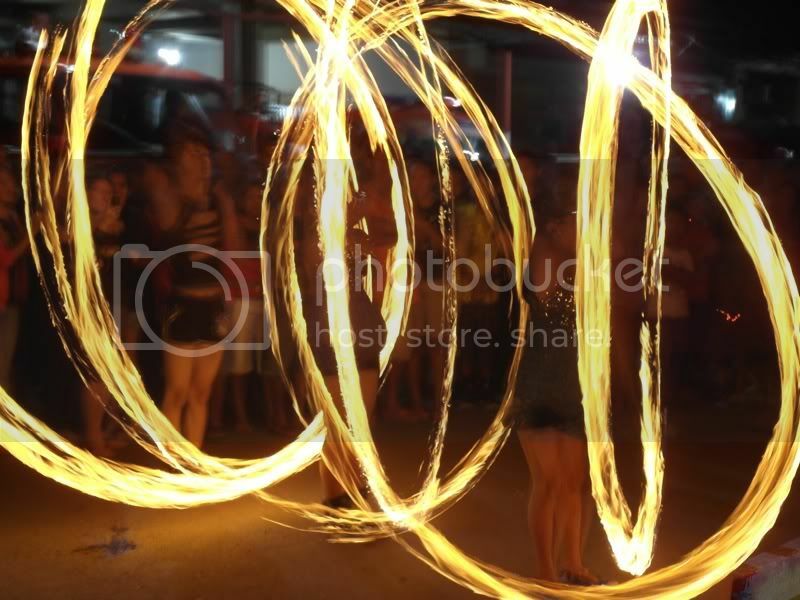 i am not a big fan of poi dancing, even the fire variety, but i couldn't help but be mesmerized by the energy of the performers, and the speed with which they handled the flaming pois. 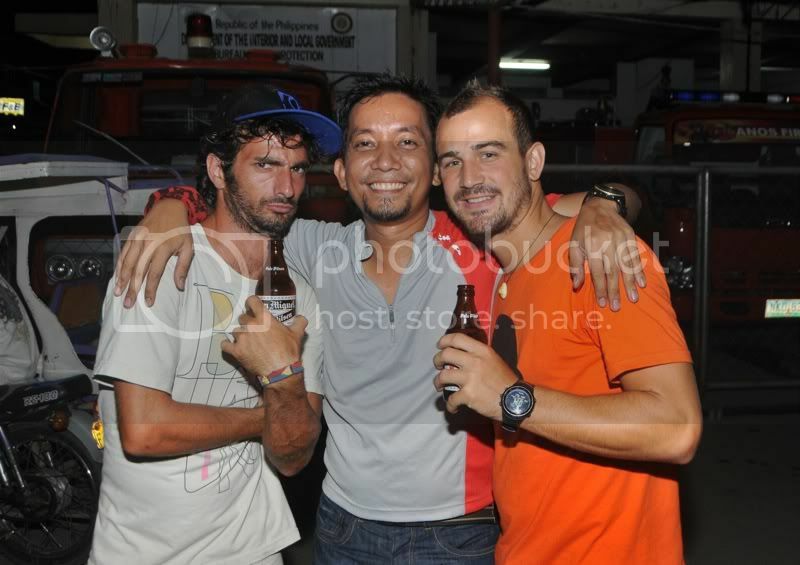 rather immediately, i found a group of french guys who would be my companions for two nights at magsaysay park. at one point, i even bought each one of them balut, which they ingested with only a little trepidation. over at magsaysay park, the party lasted till the wee hours of the morning. bands from all over panay, and even brownman revival, played to an approving crowd, which formed dancing caterpillars around the area, and even up on the stage. i must have danced intimately with at least 20 strangers, some of whom i will never see again, some of whom i might even deny having ever danced with. for two straight nights, i walked home, and woke up the following morning forgetting the precise time when i decided to leave the merriment, and finding myself in bed, my wallet and my cellphone not missing, my sanity intact, and my feet aching, if not sullied. 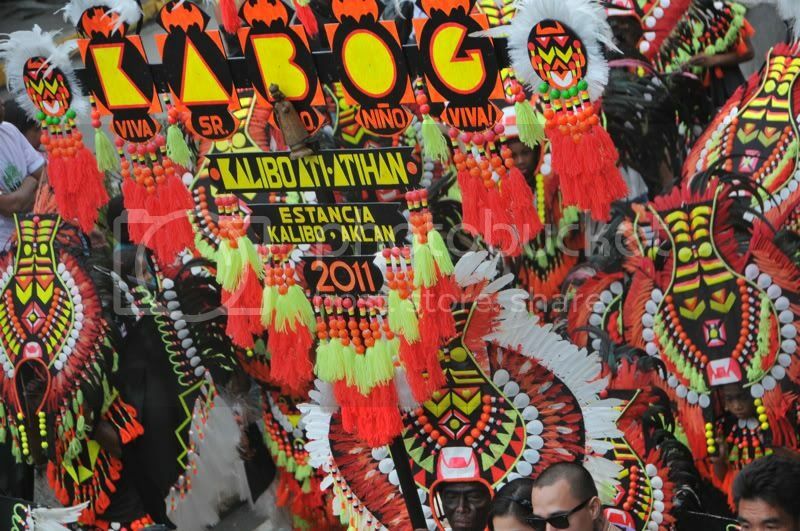 so i will remember kalibo and its ati-atihan neither for the heart-thumping performances of the various groups nor their extravagant costumes. not for the size nor the breadth of the fiesta. and much less for the fantastic cuisine that was served. rather, i will remember it for the things that one does not expect: the absolute chaos that resulted in groups bumping into each other, and rival bands playing opposing tunes that resulted in cacophonous disarray. i will remember it for the crazies who walked out of their homes in the strangest of attires, unmindful of the stares and the snickers, eager only to give at least one person a good laugh. i will with much fondness recall the goodness of locals who shared their brews with me, who stomped their feet alongside mine, who rubbed me in areas only strangers can, and who appreciated me even when, and particularly because i was, in my wildest. but most importantly, i will thank the fiesta for reminding me how happy i am being myself, being by myself. that i can find joy in the company of complete strangers, and equal joy lost in my own world. i have always been a lonely traveler, not to describe my emotion when i travel, but to denote my choice to walk out of the usual spaces i occupy, alone, to be consumed by all new things around me. i may have forgotten some of those things, and am i ever glad that ati-atihan gave me a rude awakening. some dance to forget. i danced to remember.